This application was written a long time ago, when I knew nothing about nothing. It shouldn't actually be used for any sensitive information - it's not very secure or robust. I've got loads and loads of user id's and passwords lying around that I don't use very often and so tend to forget. Now, they're not very important, they don't warrant buying a safe, but I like my privacy and so I don't wanna leave them lying around in plain view either. So I coded a little, no-good program which just performs simple substitution, replacing one character by another, depending on the users choice. Well, not much to explain, just download and try it out. 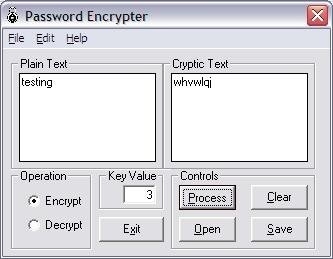 You can download Password Encrypter v1.0.0 in a zipped file (1.37 MB) from the attachments on this page, below.